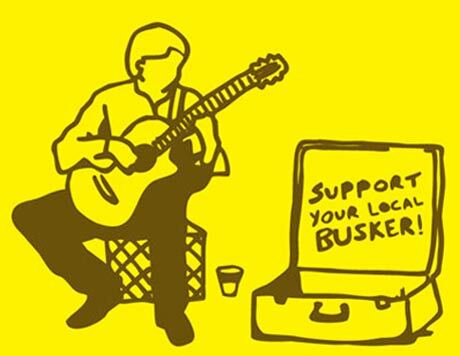 Following a number of recent incidents in which legal street performers have been fined by police for soliciting, Hamilton buskers and culture lovers alike are planning an event to demonstrate that "busking is art, not begging." The incidents started in January with the fining of 53-year-old Ken Steffler, a busker for more than 25 years, by police for soliciting under the provincial Safe Streets Act, the Hamilton Spectator reports. The law, which passed in 1999 to quell the number of aggressive panhandlers and "squeegee kids" in Ontario's city streets, was being applied to legal buskers. "They're using the Safe Streets Act to threaten buskers," Mike Leech, who was warned by police no less than three times for playing his fiddle, told the newspaper. "It was never designed for that and it's a violation of people's rights." Steffler claimed, "I'm not a beggar. I'm working. Street musicians should not be put in the same category as someone who shoves their hand in front of an old lady's face asking for money." Hamilton Police Superintendent Bill Stewart acknowledged the incident, explaining, "We have several new core patrol officers who are out there and some of them aren't as familiar with some of the regulars." Stewart added that he spoke to the officer "to explain that aggressive panhandlers need to be the focus," but since January, buskers have reportedly continued to be pushed around by officers. After being fined $65 for playing too close to a bus stop, Steffler sought to fight the ticket, and on Tuesday (April 13), the Spec reported that Steffler and a second musician - an unnamed fiddler - are being represented by lawyer Michael Puskas, who appeared in Ontario Provincial Court Monday and told the paper "police are really stretching the law to apply it to buskers." Puskas added, "I live downtown and I feel for people who want to clean up the drug dealers and the other problems, but I think people who stand out and play guitar make downtown a nicer place to be. At the end of the day, they are being bullied because they can't afford a lawyer." But Puskas, who took the case on pro bono, isn't the only one fighting for the buskers' cause. In response to the incidents, a Facebook group named "Busking is art, not begging!" now has nearly 500 members, all of whom either intend to participate in or support the lining of Hamilton's James Street North with musicians on April 23. "All will be welcome," the group's description reads. "They're your streets." You can read the full description of the group's intentions and join the group here. Musicians interested in playing can contact [email protected] now.